THE “FIERY CROSS” IN THE WEST. As the route march moves eastward the column not only grows in numerical strength, but it takes on more and more the character of a drilled and disciplined force. The men are marching well and learning all they can of the game. One platoon has now been formed, and a second approaches full strength; acting non-coms, have also been appointed ; and as each fresh batch of recruits is added, the men are quickly “licked into shape.” The commissiariat department is working more and more smoothly; and the intelligence department is also getting into smooth running order. Mr. Harley Blackett has placed his car at the disposal of the force, and an intelligence officer goes over the ground in advance of the column checking the arrangements for camping and receptions, and studying the roads from the standpoint of a marching army with a certain distance to cover in a given time. The consequence is a clockwork adherence to the time-table. 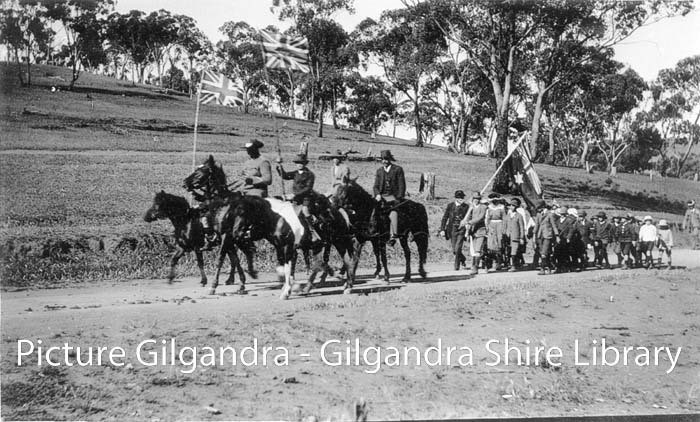 The column marched out of Wellington nearly a hundred strong, including the staff and commisariat assistants; but the published story that there are already a hundred recruits is an “intelligent anticipation of events.” Twenty-six additional men joined at Wellington, so, with Gilgandra’s thirty-one, Dubbo’s nine, Wongarbon’s eight, and Geurie’s two, there were exactly seventy-six sworn recruits when the march swung out of town on Monday morning. Before the column had proceeded far the sergeant of police, an indefatigable recruiter, had overtaken it with four more in a motor car, and yet others are known to have thought the matter over, and to have decided to “catch up with the procession” in a day or two. Advices have been received from towns along the line that numbers of men arc only waiting for the necessary forms to come along, when they will join the great march. Soon after leaving Wellington, a fine, large ensign was presented to the captain by Mr. Bertie Gaden, and this flag now floats from the top of No. 1 transport waggon, in company with a Union Jack. Lunch was prepared by the “Coo-ee’s” cook at Mr. J. Hoffner’s farm, a pleasant break in the day’s tramp. Dripstone turned out in force to welcome the “Coo-ees,” and a fine tea was provided in the hall by the ladies. Considering the smallness or the settlement the reception was a remarkably fine one. A noticeable feature of the entertainment afforded the column on its eastward march is that the smaller the place the more trouble is taken by the people to assist and entertain the men, and it might almost be said the heartier the welcome. As instances, Wongarbon and Maryvale, might be quoted. Wongarbon has certainly eclipsed all others, and its gifts and good cheer were out of all proportion to its size.